February 10, 1979 was a day of infamy for farm workers. It was a day without joy. The sun didn’t shine. The birds didn’t sing. The rain didn’t fall. Why was this such a day of evil? Because on this day greed and injustice struck down our brother Rufino Contreras. What is the worth of a man? What is the worth of a farm worker? Rufino, his father and brother together gave the company 20 years of their labor. They were faithful workers who helped build up the wealth of their boss, helped build up the wealth of his ranch. What was their reward for their service and their sacrifice? When they petitioned for a more just share of what they themselves produced, when they spoke out against the injustice they endured, the company answered them with bullets; the company sent hired guns to quiet Rufino Contreras. Capitol and labor together produce the fruit of the land. But what really counts is labor: the human beings who torture their bodies, sacrifice their youth and numb their spirits to produce this great agricultural wealth?a wealth so vast that it feeds all of America and much of the world. And yet the men. women and children who are the flesh and blood of this production often do not have enough to feed themselves. But we are here today to say that true wealth is not measured in money or status or power. It is measured in the legacy that we leave behind for those we love and those we inspire. In that sense, Refino is not dead. Wherever farm workers organize, stand up for their rights and strike for justice, Rufino Contreras is with them. Rufino lives among us. It is those who have killed him and those who have conspired to kill him that have died; because the love, the compassion, the light in their hearts have been stilled. Why do we say that Rufino still lives? Because those of us who mourn him today and bring him to his rest rededicate ourselves to the ideals for which he gave his life. 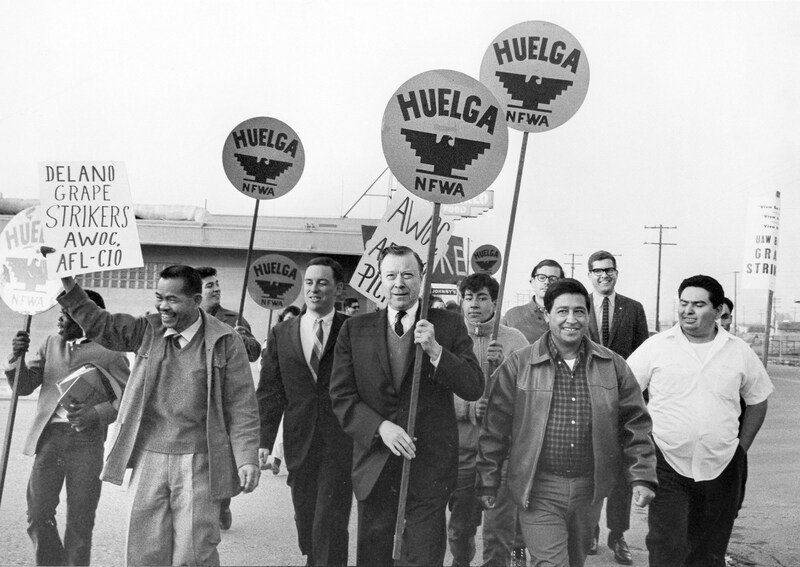 Rufino built a union that will someday bring justice to all farm workers. This is a day of sorrow, but it is also a day of hope. It is a time of sadness because our friend and brother is dead. It is a time of hope because we are certain that Rufino today enjoys the justice in heaven that was denied him on earth. It is our mission to finish the work Rufino has begun among us, knowing that true justice for ourselves and our opponents is only possible before God, who is the final judge. * Rufino Contreras was a 27-year old lettuce striker shot to death on a UFW picketline in on February 10, 1979. Cesar Chavez delivered this eulogy before thousands of farm workers on top of a flatbed truck serving as an alter during an open-air funeral mass in Calexico just yards from the California-Mexico border.